Remote communities in Nepal have been among the hardest hit and many have not been accessed by aid teams since the earthquake. We began our day at the Kathmandu airport, working with our lead partner to send an emergency aid shipment to the remote mountain district of Sindhupalchok, where Chaku Village is located. 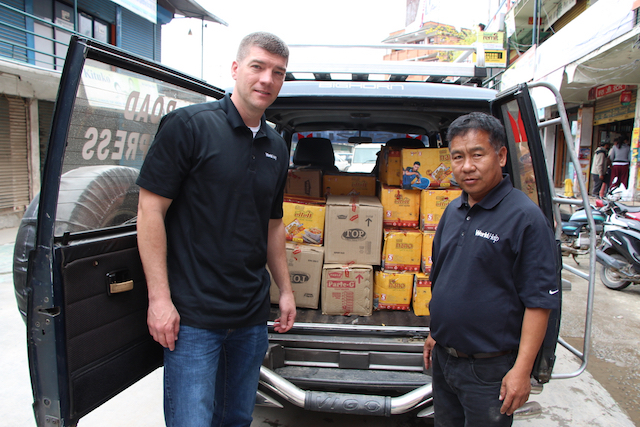 Director of International Programs Mark Hogsed, and our lead Nepali partner, Pastor Kam, loading aid bound for the Sindupalchok district. This is a village that is particularly dear to our hearts. World Help has been doing outreach projects in Chaku for over 15 years and has developed deep friendships with the people there. Needless to say, we were determined to ensure that these brothers and sisters received food, shelter, and a little reassurance that more help is on the way. Watch Nepal Earthquake | Aid & Relief from World Help on Vimeo. Since all available helicopters in the Kathmandu area are being utilized primarily in the search and rescue efforts, (as well as the grim task of transporting the deceased) little or no aid has reached areas like Chaku. The only way we could manage sending this shipment—which included enough food for 100 families for a week—was to forfeit our spots on the helicopter so more victims could be transported on the way back. The roads, from what we can determine, are still impassable. One of our friends from Chaku said he traveled seven hours on foot from the village before he was able to find a ride into Kathmandu. He told us that he saw an entire bus of 50 people buried in a landslide in the district . . . all perished. Please pray that God will continue to provide ways for us to reach the people of Chaku with much-needed aid. Hundreds of lives depend on it. From there, we traveled to the village of Dahachowk, about an hour from the capital. 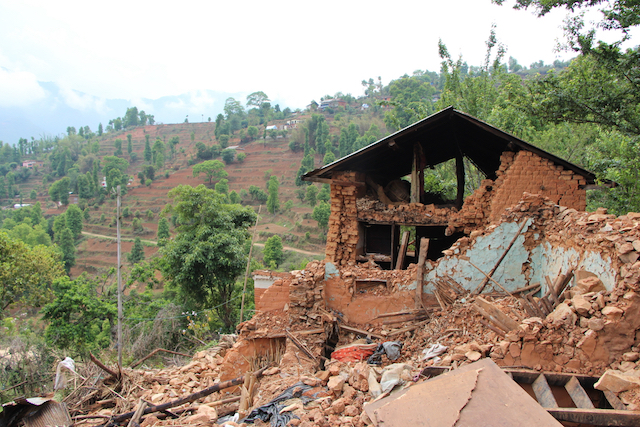 The village is positioned on a hilltop and several homes were completely destroyed. At least two people were killed in this tiny community alone. One of them was Goma’s brother-in-law. Goma shows us where her home was destroyed. The 14 family members that lived with Goma are now huddled under a tent nearby. 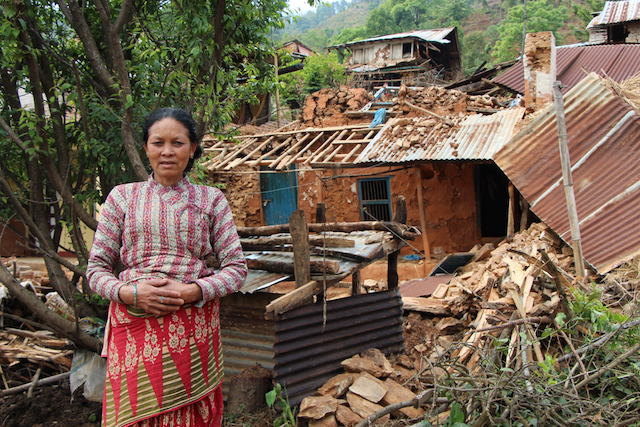 They told us that until now, no one had been able to bring any supplies to them since the earthquake. Our teams passed out food and crucial items to 43 families in the village who were overwhelmingly grateful to our supporters. 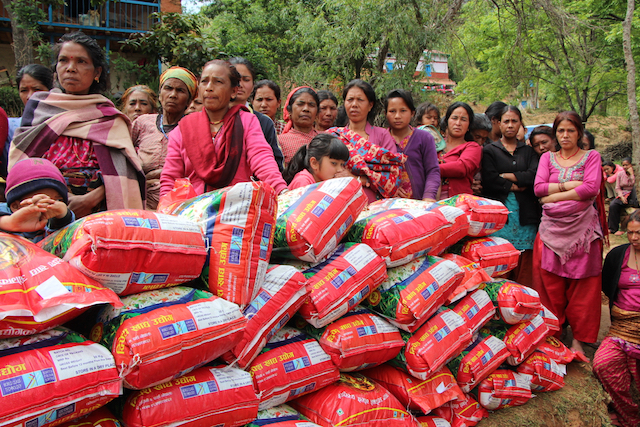 We can’t emphasize enough how much this aid means—it’s the difference between life and death for so many here in the rural areas of Nepal. Thank you to those who gave and who are still giving now to relief efforts. 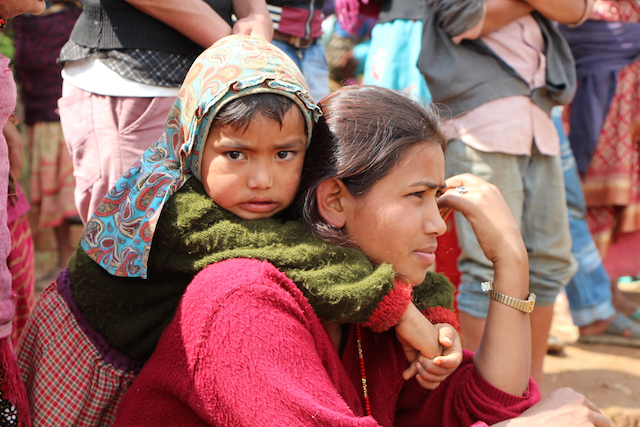 Your generosity is literally saving lives in the midst of one of the most desperate times in Nepal’s history. After assessing the needs in great detail, it has been confirmed that we can provide shelter and food for a Nepali family for an entire month for as little as $50. The potential for impact is truly incredible. If every single one of our supporters decided to sponsor one family, just imagine what we could do . . . imagine the hope we could give! Phase 1: Provide immediate, life-saving aid to victims and families. Phase 2: Work alongside the people to rebuild churches, homes, and other infrastructure that has been destroyed by the quake. Please partner with us in this crucial time of need. Pray. Give. Do anything you can. Being on the ground these past two days, we have already seen firsthand what a difference a few committed people can make, even from thousands of miles away. It’s going to take all of us working together to help lift up the people of Nepal from the rubble. Start with committing to one family in need . . . and just watch as God accomplishes more than we could ask or imagine.